This is what the world looks like through my baby blues. 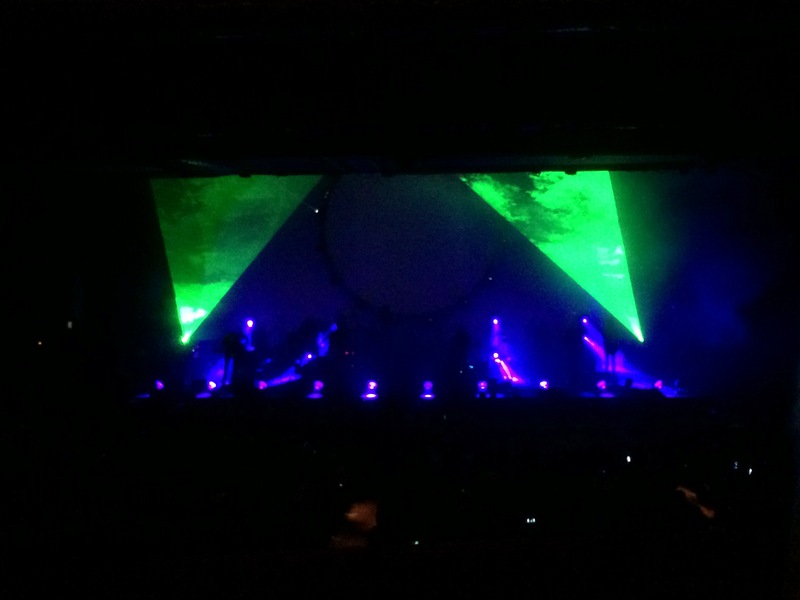 A ton going on right now in my life and much, much to write about, but I’m going to go a topic at a time, so today’s topic is my outing last Thursday night to see Brit Floyd, ostensibly a “Pink Floyd Tribute Band” play the music of Pink Floyd at the Chicago Theater. I’ve never been a huge Pink Floyd fan – and in fact, it’s a topic of humor with my wife of late – we both realized that with Pink Floyd, Led Zeppelin and a few other major acts, there are a lot of songs we know and music that we like, but don’t ask us the names of the songs, and don’t ask us to name our favorites, as we won’t be able to tell you. 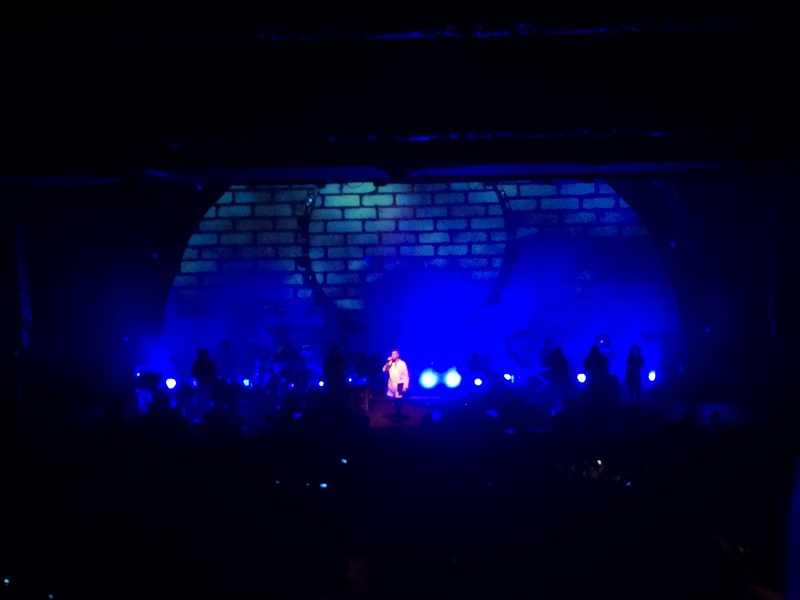 Now that said, it is a wee bit easier with Pink Floyd – there’s a couple of major songs from The Wall (Another Brick …, Comfortably Numb), from Dark Side of The Moon (Money, Time, Wish you were here), etc. But even those, if you come into them in the middle of the song, we don’t hit right away. The game we play now is if we’re in the car listening to Classic Vinyl on Sirius XM, and a Pink Floyd/Led Zeppelin, etc. song comes on, is to cover the radio display and say “Ok name it” … and neither of us can. ANYWAY (the linguistic version of when you realize you’re down a rabbit hole you didn’t intend to explore), my friends Beavis and Peter Pan started emailing when this show was announced, and I thought it would be a good way to both have a great night out with two good friends and also perhaps get to know this music better. So, the whole “Tribute Band” thing seems to be something that has cropped up in the last 15 years or so – bands that specialize in the music of one famous act from the classic rock era – and now starting to extend into the 80s and 90s. Most of these are bar bands, some of them go so far as to basically play characters that are intended to be the original members (can you imagine the arguments? “I want to be Paul Stanley.” “No, I do, I can do the New York accent better.”), complete with costumes. And some even go further than that and play them in different eras. A local Beatles tribute band, Modern English does that – starting out in classic “Ed Sullivan/Liverpool” dress of black suits and skinny ties, morphing into Sgt. Pepper costumes, and then into the White Album/psychedelic era wear and wigs, fake beards, etc. As I said, for the most part, these are bar bands, or at best, are touring local festivals – like Modern English does all summer in Chicago doing every “Taste of” “4th of July Fest” etc. around. That got me thinking – is this really a new phenomenon, this “Tribute Band” thing, or is it something that has gone on for a long time – and the analog to it popped up like stepping on a rake – for the most part, most “city symphony” orchestras (like the Chicago Symphony), are tribute bands but are tributes to Bach, Beethoven, Mozart, etc. Now that said, really what they are is cover bands – playing the music of others, where truly a “tribute band” does the music of one band/artist, etc. But, it really isn’t something truly new. 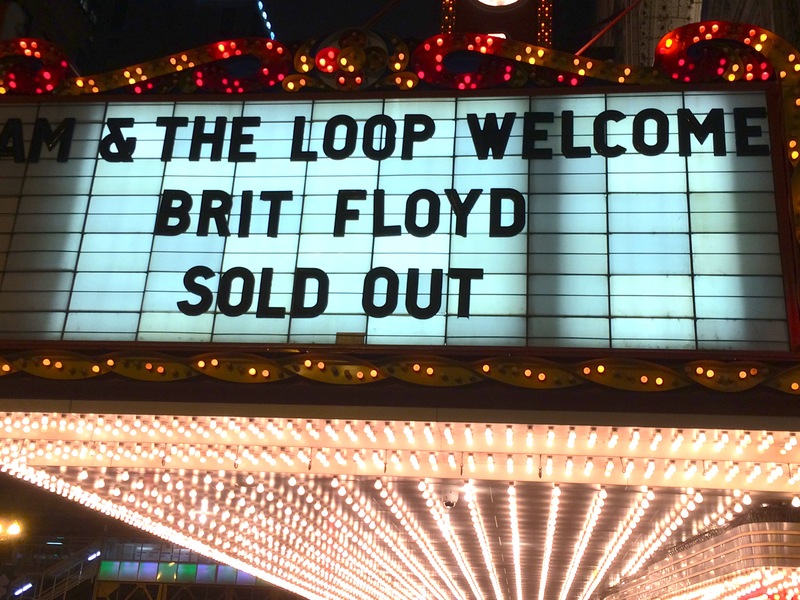 So, on to Brit Floyd – so what makes Brit Floyd such a cut above other “tribute bands” that they sell out a 6500 seat theater in Chicago at ticket prices ranging from $45 to $120/seat? Versus going and seeing “Journey to the 80s” an 80s tribute band with a hairy overweight guy screeching out his best Steve Perry falsetto? Quality … and musicianship, through and through. That and these guys WEREN’T playing characters. Were they a band that only played the music of one artist/band? Yes. That’s where the similarity ends. 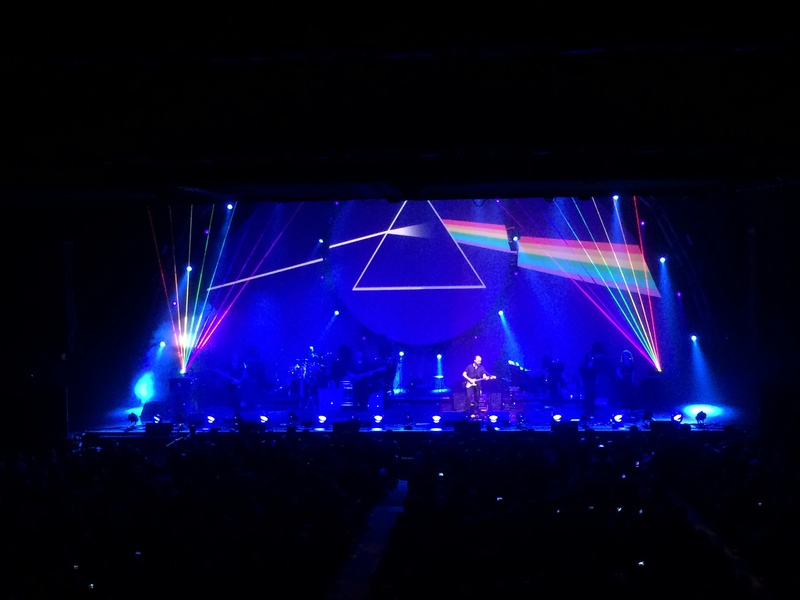 To give it an analog, Brit Floyd is the equivalent of seeing the CSO play Beethoven’s 9th symphony in its entirety, while some bar band Pink Floyd tributeers might be the equivalent of the local high school’s “B” level orchestra scratching out the first movement. 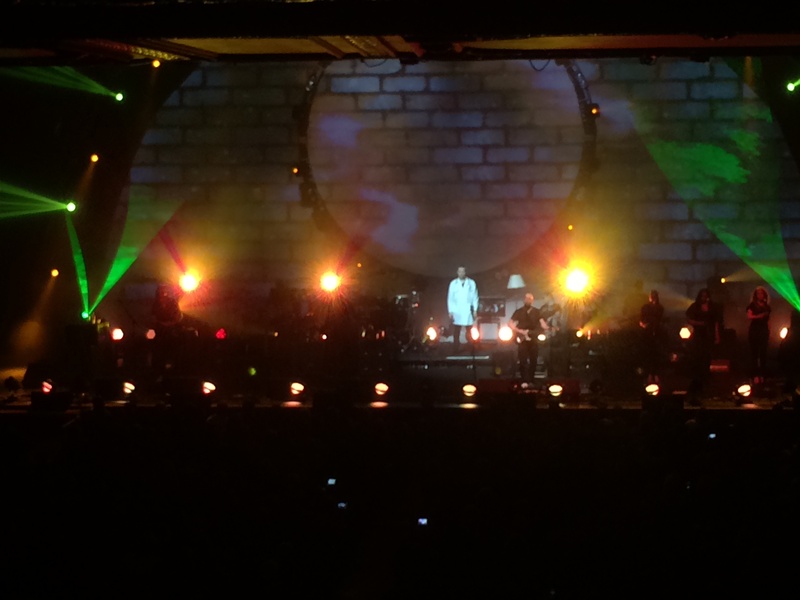 Unbelievably professional musicians, incredible staging and production values, and while they were faithful to the Pink Floyd music, they also made it their own by extending the songs deeply – “Another Brick In The Wall” goes from being a 4:15 album cut or a 3.5 minute radio play to an 8 minute jam with extended/expanded guitar solos, a unique ending, a deep/long beginning that worked into the start of the song, etc. It was like that all evening. And it was incredible. 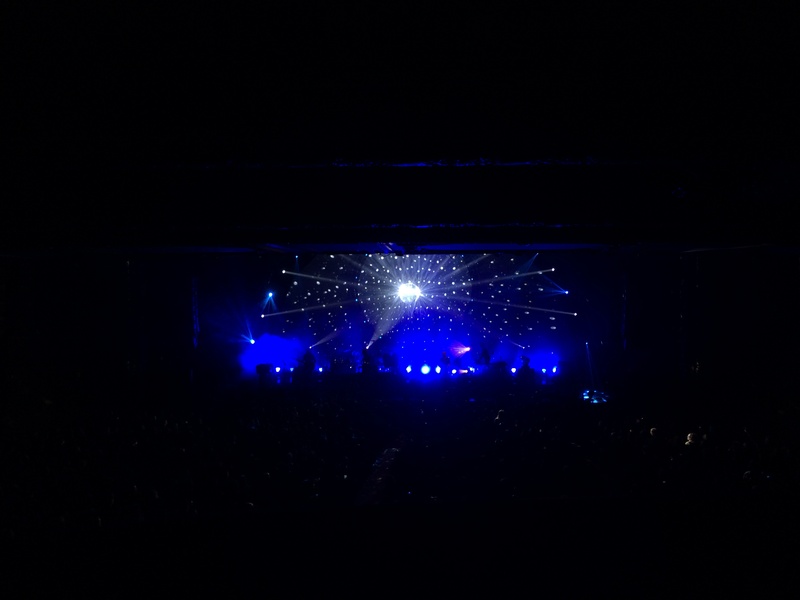 That was some of the best rock music I’ve heard in a long time. The guitarists were virtuosos – both playing and contributing incredible versions of David Gilmour’s soaring guitar solos. They had two percussionists, an incredible group of female backup singers, etc. And their vocals, while again true to the Pink Floyd genre and sound, were their own voices – they weren’t playing characters, or singing in affect accents or any of the other typical Tribute Band garbage you see in the bar bands. As I age, and become more and more attached to music as my right brain outlet, both playing and listening, I have often wondered, “what is the future of rock music”? An acquaintance of mine, Dean, who is a professional musician, playing everything from folk to rock to blues to jazz and multiple instruments, has of late been posing the question – “when did music make the turn from professionalism to production values?” He promotes his gigs as “no auto tunes, backing tracks, loopers, or unnecessary electronics – just pure quality music.” Versus seemingly anywhere you go to hear music these days, bands use backing tracks to add additional instruments, people, etc. that aren’t out there playing. I’ve been thinking about that, and about, “what happens to the music we love when the artists die off or retire (or both)?” Certainly there are these tribute bands in the bars, but I hope there is more “Brit Floyd” level acts forming up to cover and expand and interpret and make their own, the music we all know and love. I, for certain, would pay to hear that. Much more to come in the next week or two … lots happening. Life is for living. So live it. Driving Inertia – Paul Olson's "walkabout" blog Blog from former iCrossing colleague Paul Olson, who sold all his stuff, quit his job, and is being a modern hobo around the country in a minivan with his wife. Great Finds from iCrossing The minds at iCrossing share our great finds.